I wasn't really sure what to expect when I signed up to pre-read Craving Connection, and I was pleasantly surprised! I LOVE the format of the book, covering sections on our connections with God, friends, and community. The women's testimonies of what they learned and how God worked are personal and thoughtful. The activities (questions and challenges) make it perfect to do alone with a journal, or with a small group of friends (or soon to be friends!). Bonus is the Author Questions and Answers in the back of the book! These girls are real. This book is for most ages and stages. I LOVE Deidra Riggs chapter on "When You Feel As If There Must Be Something More," written from her early stages as a young mom and pastor's wife and reflected on with the wisdom from today. The other women all have important lessons too, from single, married, moms, no kids kind of women. They're all there. Mostly, I love the focus on our relationship with God found in these pages. It's all His, and they keep pointing to Him for the solutions. So needed in today's world. View the video from B & H Publishing here. 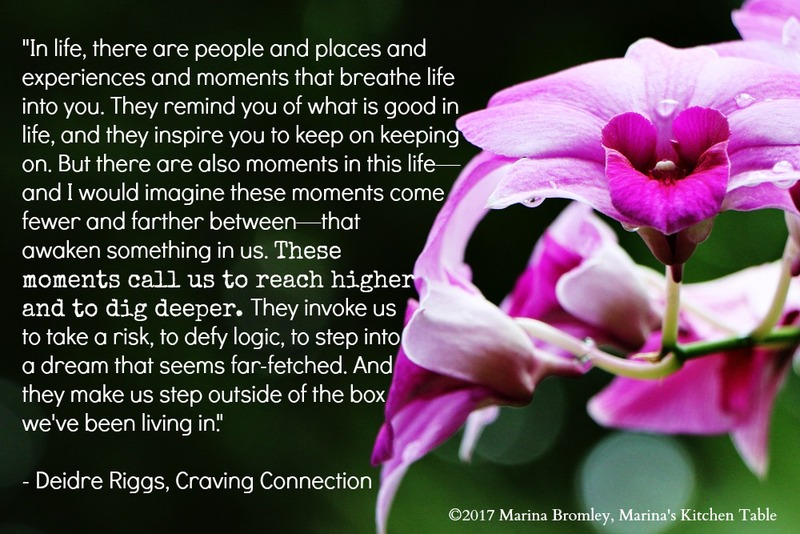 I received an advance copy of Craving Connection from B & H Publishing, in exchange for my honest review of the book.